With an ever-increasing selection of options, mobile accessories are quickly becoming the sweetheart category of promotional products in 2012. Available in a range of colours and price points, mobile accessories are a great promotional option for your next event! As any Ad-Spec Pro will tell you, the success of a promotional product lies in its function and the likelihood that it will be reused. 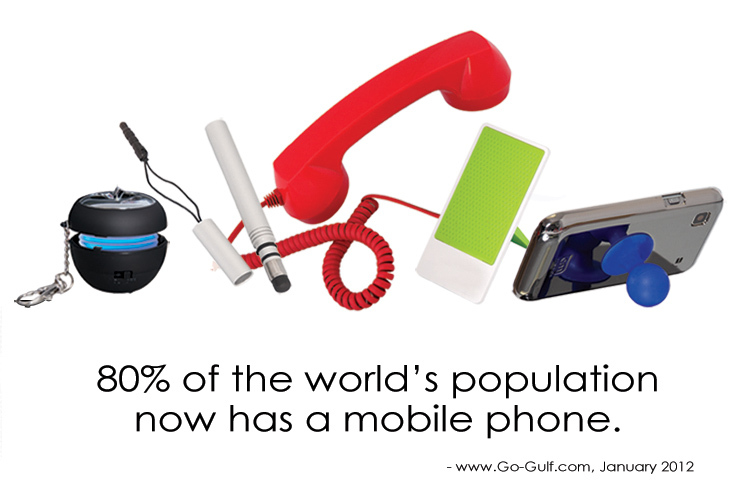 Our lives continue to grow increasingly mobile, so it only makes sense that promotional products follow that directive. Seize the opportunity presented by mobile accessories and get people talking about you! While this may be a MINI speaker, you’ll be amazed by its MIGHTY sound! This handy mobile accessory can be used with your cell phone, mp3 player, laptop, ipod, tablet, or anything else that has a 2mm jack. Click here for more details. This soft tip stylus was designed specifically for use with smart phones and other touch screen devices. It reduces typos and keeps your screen free of scratches, smudges and fingerprints. Click here for more details. This retro phone handset combines old and modern technology for an ideal mix of cool and functional promo. Simply plug the handset into your phone’s audio jack and dial normally on your cell phone. A small button on the handset allows you to easily answer/disconnect calls while keeping your mobile device away from your head. Click here for more details. Ideally suited for use in the office or around the home, this accessory keeps your cell phone, ipod, and mp3 player handy. Simply place your phone or other mobile device on the silicone anti-slip mat and adjust to the appropriate angle. Click here for more details. Affectionately nicknamed, “the kickstand”, this accessory allows you to prop up your smart phone to view multimedia hands-free! Easy to use, the strong suction cup holds your phone in place while the ball props it up. Click here for more details. This entry was posted in Accessories, Marketing, Technology and tagged Accessories, Anti-Slip Electronics Holder, Marketing, Mini Rechargeable MP3 Speaker, Mobile, Promotional Products, Retro Phone Handset, Silicone Ball Phone Stand, Stylus Touch Screen Pen, Technology Accessories by Debco. Bookmark the permalink.